← How many cars can an Sn2 Forney Pull? Sorry for the delay in posting notes for my clinic. In giving the clinic I too learn, so I wanted to make a few updates before posting. Thanks to all who attended and contributed to my clinic you participation made it all worth while. For those who could not attend the clinic, the model railroad PAR&NCo. is an HO scale model railroad set in 1910. It is was used as the example during the clinic. The PAR&NCo has 4 mainline town and a small branch to log loading. The railroad is in a 16×16′ room and the dispatchers desk is in an adjacent room. I’m not a real railroader, instead I’m a model railroader who believes that bringing a model railroad to life through prototype based operations is lots of fun. Honestly, I’ve only operated with TT&TO on sessions I’ve setup on my Sn2 SR&RL (dismantled in 2006) and a friends HO PAR&NCo. These are small model railroads, but still worthing of operating. I’ve obtained most of my knowledge by reading model railroad publications and a few prototype publications. So all credit to this clinic goes to those who have shared their information, thanks. Below is a list of references to get you started too. The list is not comprehensive. SWOOPS Ops Event: http://www.swoops2011.wordpress.com (you can operate the layout in the clinic or an HOn3 EBT layout). There are many such events around the country (20+ a year). There is no better way to learn about operations than to operate on other railroads. To find out about these events join the OpSig. Get out and operate. This clinic is about the Movement of Trains only. 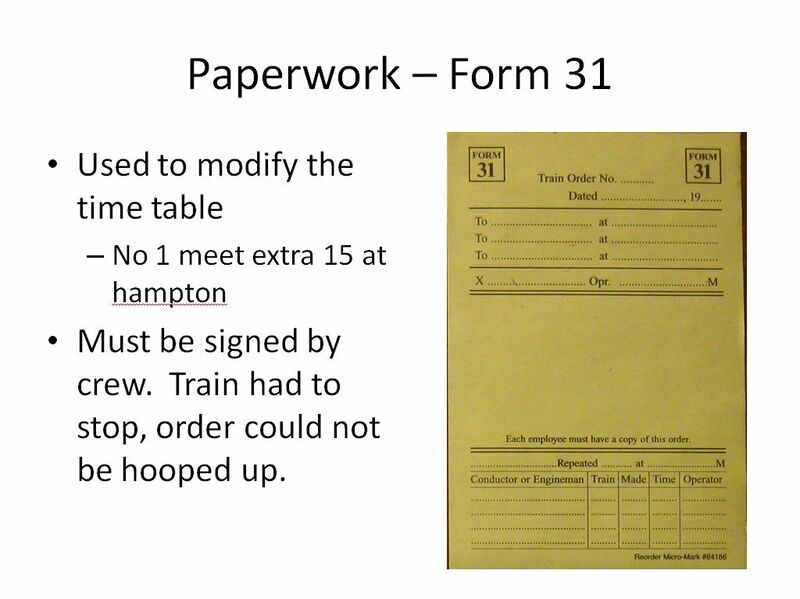 Specifcally by the means of Time-Table and Train Order (TT&TO). Some rolls/trains are easier than others choose a roll that suits you. Run an passenger train for ease. Run a local extra for challenge. Properly applied crews do not write things down. Only the Dispatcher and Operator(s) write. Signup to run a train. Calcualte the travel time between each town. For the PAR&NCo. 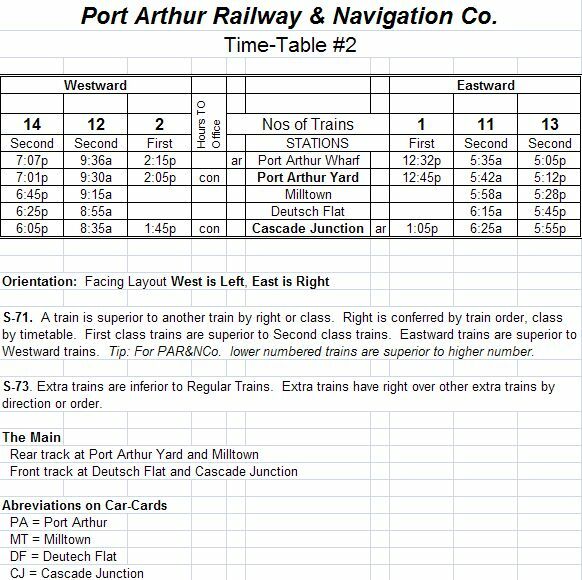 6:1 was choose because passenger trains and a complete railroad day occurs in 3 hours or so (up to 18 hour railroad day). Future – I predict computer driven clocks will apear on wireless phones (along with throttles). Operator(s) are not descision makers. Decisions are made by the DS and crews. The operator is a communicator. Ths is a low pressure job for those who do not want to work hard. PAR&NCo. Dispatcher's sheet. This sheet is used by the dispatcher to track trains on the railroad. Model railroad owners may replace this sheet with a magnetic board. 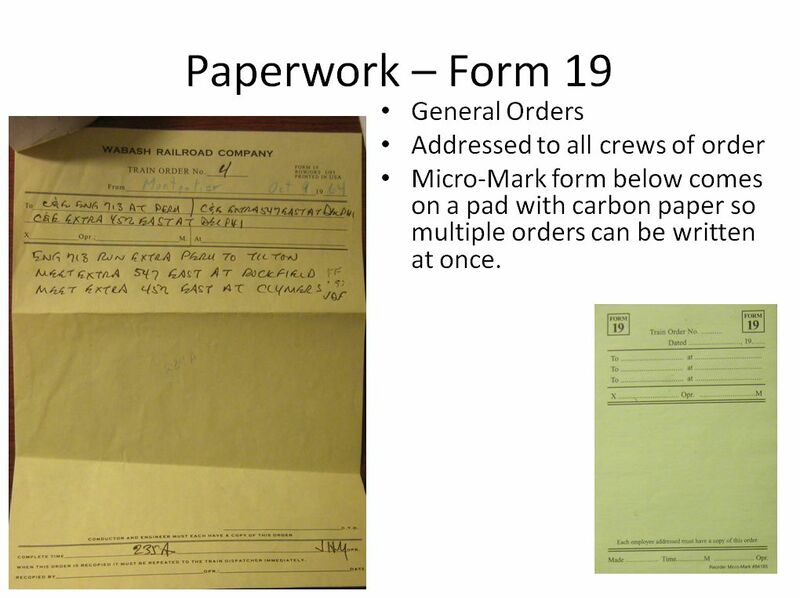 The advantage of the paper form is that there is a record of what occurred. May model railroad have employee time-tables too. I find them hard to use for first time or some time operators. The operators can not determine what is “critical” to their job. As such, the PAR&NCo. uses guides for each job (as shown above). 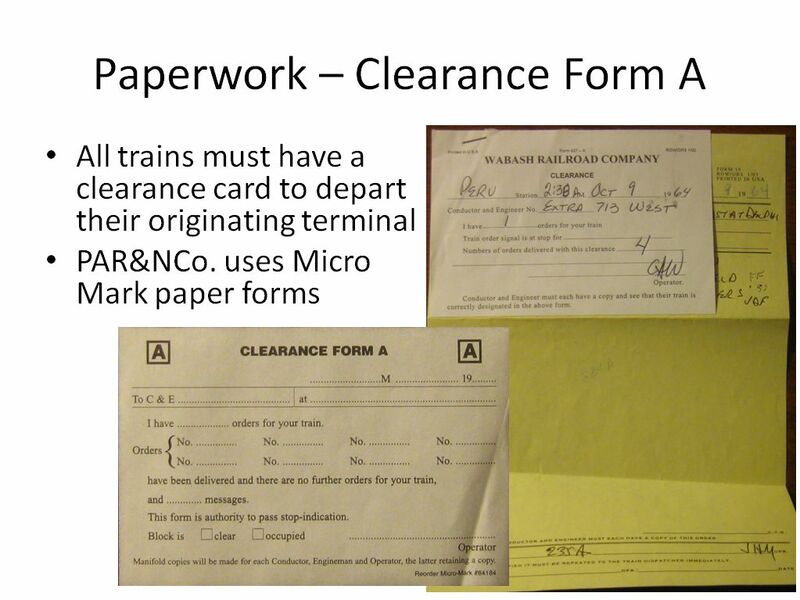 The guide is a one page document that an employee can read and digest and reference as they break in to a specifc job on the railroad. I suggest having employee time tables as your crew advances. They are a cool thing to model! All railroads followed a comon code. Even the narrow gauge railroads. 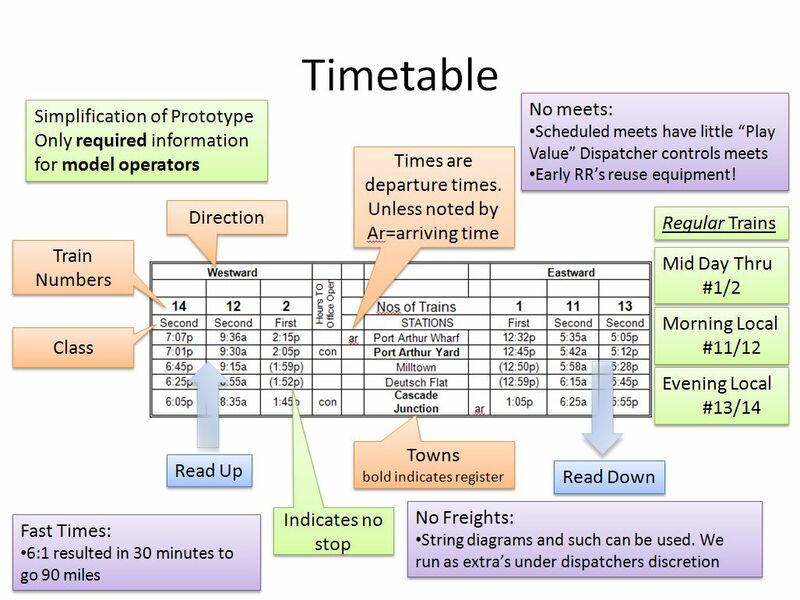 Many employee time tables only contain the railroad specific deviations from the code. I probably should have proof read this more….but I just wanted to make it available…as soon as possible….